Tree stands, also called deer stands, are an enclosed or open platform secured to trees used by hunters to maintain an elevated vantage point. 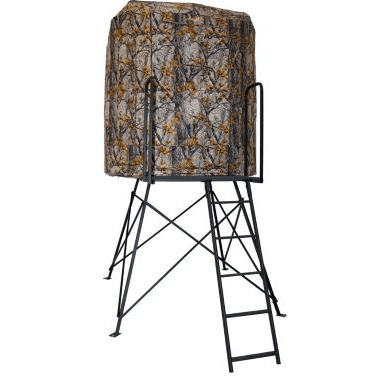 Deer stands can come at many different heights, and it may be difficult to choose the best one for you and your particular needs. Luckily for you, we’ve done the research and have provided helpful information in this article that you may benefit from when it comes to picking the perfect tree stand for you and your hunting activities. The excitement of purchasing a new hunting tool may be great, but it can also be a bit overwhelming. 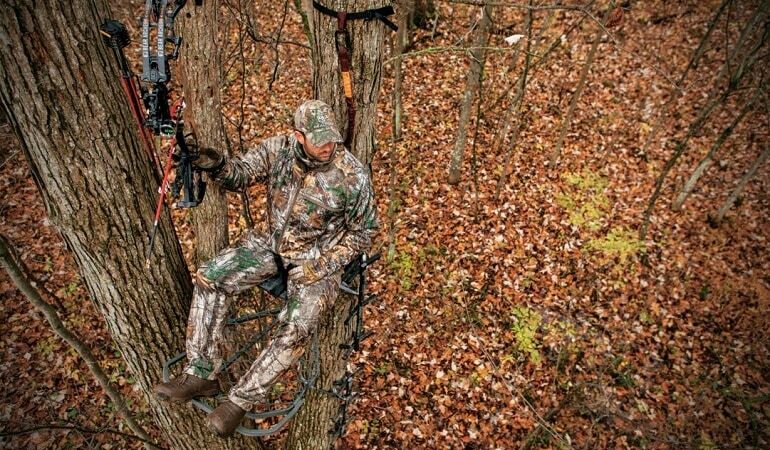 There are many aspects to consider when choosing the perfect tree stand for yourself and your lifestyle, and we’ve compiled a list of a few things you may want to keep in mind. One thing to consider is how high you’d like to place your tree stand, and if you would be able to access it easily from that height. Your safety is also important, so you should make sure you are able to safely travel up and down from the tree stand. If you want a tree stand high in the trees in order to easily spot a target, you should also plan on acquiring a ladder for easy access to the stand. However, if you decide to stay closer to the ground, there are types of hang-on stands that do not require a ladder. These types of stands work great in reducing the noise of metal pieces that other stands may have. It’s also important to consider the types of trees that typically inhabit the location where you plan on setting up your tree stand. As always, you should pick a tree that has a healthy and strong base, since this will be what ultimately supports the weight of both the stand and the hunter. You may also want to remove some limbs from the tree to better install the stand. Now that you know some things to consider when purchasing a tree stand, you may want to know why you should invest in a high-quality tree stand. It’s not only about functionality but also durability and performance. A good tree stand must be safe for frequent use, and should not endanger the user’s safety in any way. Safety features include having a ladder for easy access, having railings so you can lean forward without worrying about falling, and safety harnesses. A safety harness is essential for keeping you from falling out of the tree, a measure that I’m sure would be important to your friends and family. If you are planning on sitting in the tree stand for hours on end waiting for a target to unknowingly walk by, it would be in your best interest to have a comfortable stand to sit in. A comfortable seat will prevent lower body and back pain that could be experienced from an uncushioned solid metal seat. Any product that will be experiencing the harsh elements of the outdoors and constant weather occurrences should be made of materials that can withstand moisture and other forces of nature. Stainless steel is a great material to consider, as it does not corrode or rust, and it is quite durable and weather resistant. Once you’ve got an idea of what type of tree stand you’d like and where you’ll want to place it, the next step is to choose an actual stand. This may be a bit overwhelming since there are so many different products out on the market, but we’ve compiled a list of what we think are a few of the best stands, in hopes that one will catch your eye. The Jayhawk Ladderstand has a weight capacity of 500 pounds, and a stand weight of 122 pounds. Steel construction ensures a strong and stable design, with full-body harnesses included for additional safety. This stand can seat two people, making it perfect for you and a friend to keep each other company while you wait for a target to pass by. This stand features a 20-inch length to the shooting rail, and a platform size of 42 inches wide and 34 inches deep. The seat size measures 39 inches wide by 17 inches deep and includes a cushion and backrest for extra comfort. This is a great tree stand, especially for you and a friend or partner. This stand comfortably fits two people, with each getting their own cushioned seat and backrest to make for an enjoyable wait. Made from strong steel construction, your safety is guaranteed, especially with added harnesses for additional security while you’re up and off the ground. The ladder at the base allows for easy access, while still maintaining a quiet atmosphere as to not disturb any potential prey. Due to its durable steel design, you may want to enlist the help of a few strong individuals to assist in the setup. 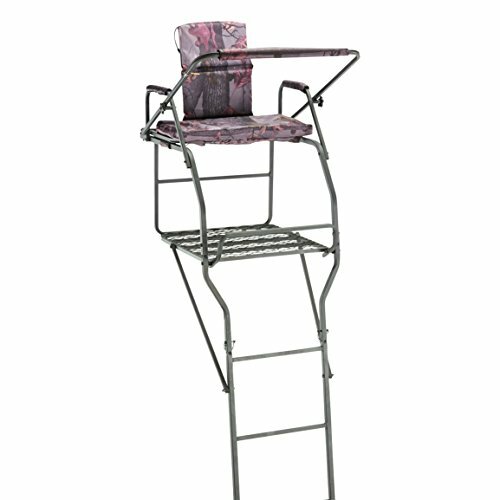 This tree stand is designed to fit one individual, with easy access made possible by a handy ladder stand. Strong welded steel ensures a sturdy and durable construction, with a powder coat finish and a ladder with a double rail to add extra stability as you enter and exit. For included safety, a safety line and adjustable tree brace with a stabilizing strap are included to properly secure the stand to the tree of choice. The entire structure weighs around 92 pounds and can hold up to 300 pounds. The seat is able to fold back, giving you more room on the stand should you need to take a standing shot. An adjustable padded shooting rail and armrest gives you comfort and also can help in stabilizing your shot. Overall, this is a great tree stand to have if you spend hours sitting and waiting for a target to wander by. The seat is comfortable and foldable, so you’re able to create more room on the platform and take a standing shot if necessary. The double railings on the ladder add easy accessibility to the platform, and the padded shooting rail functions as an armrest while also being able to provide additional support to stabilize a shot. Like all heavy duty and well-constructed stands, this one will require the help of multiple strong individuals to set up, and the instructions are not very helpful, so set time aside and be patient. 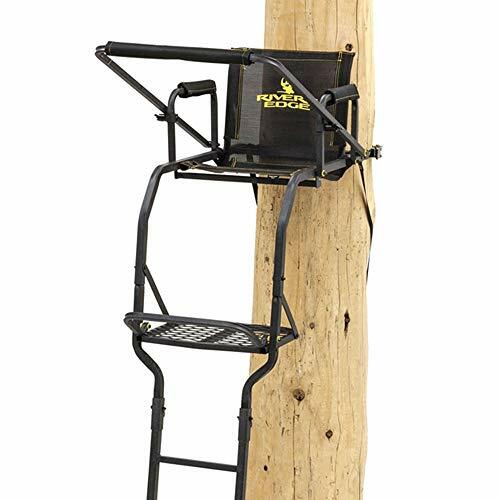 The Jumbo Ladder Tree Stand features rugged steel construction, durable enough to last through many years of use and outdoor exposure. The dimensions of the top of the stand are 24 inches by 25 inches, with a foot platform to give your legs and feet plenty of stretching room. A padded seat and padded armrests will improve your comfort, while the padded armrests also aid you in steadying your shot. An adjustable support bar and full-body safety harness keep you secure and safe while you’re off the ground. The shooting rail, footrest, and seat are all flip-up, which allows you to have more room to stand and shoot if necessary. This is a pretty good tree stand, able to provide you a higher viewpoint for hunting, while also being comfortable enough to sit in for hours. The ladder features three pinned sections that make for easy transportation and storage. It does, however, take quite some time to assemble the entire stand, so be patient and request help from a few friends in order to get the job done faster. This stand has lots of adjustable features, such as the flip-up seat, shooting rail, and footrest. The paint job on this tree stand is a bit troublesome though; reviews of this product indicate that the paint easily chips and flakes off. This tripod tree stand works just as a tree stand would, but without the tree! It gives you a vantage point from higher ground in order to spot a target, without the hassle of attaching and securing it to a solid tree base. 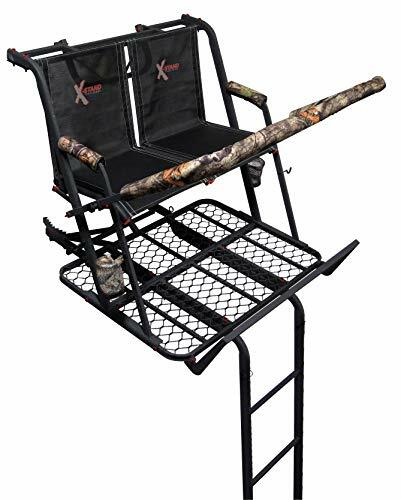 This tree stand is 12 feet in height and features a chair that can rotate 360 degrees, a 20-inch diameter footrest, and three foldable legs for easy transportation and storage. Padded armrests add extra comfort and a stationary rail helps you steady a shot. The sturdy steel material is easy to assemble, and the tripod design allows you the freedom of following a target and bringing your vantage point with you. 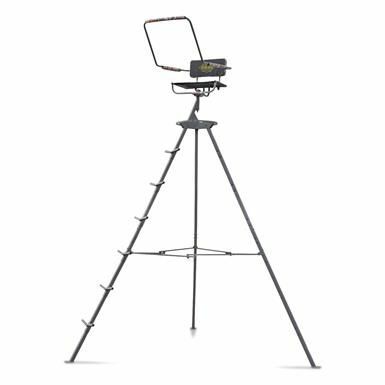 This tripod tree stand is great to take out on the field if you’re alone and not wanting to take the time and effort to set up a tree stand. The tripod design allows you to easily put together and dismantle the stand, so you can take it with you as you track a target. Though it is a little bulky, it is relatively easy to set up alone, and it has sturdy features and comfortable accessories, such as the seat and armrests. This stand has a height of 20 feet and is made for two people—you and your hunting buddy of course! The steel construction is sturdy and reliable, able to hold a weight of up to 500 pounds. The pinned ladder sections allow for easy assembly and dismantling. A backrest cushion and padded armrests are added for your comfort so you can sit for hours on end. The platform is 55 inches by 14 inches, with seat dimensions of 36 inches by 14 inches, giving you and your partner plenty of space to move around. 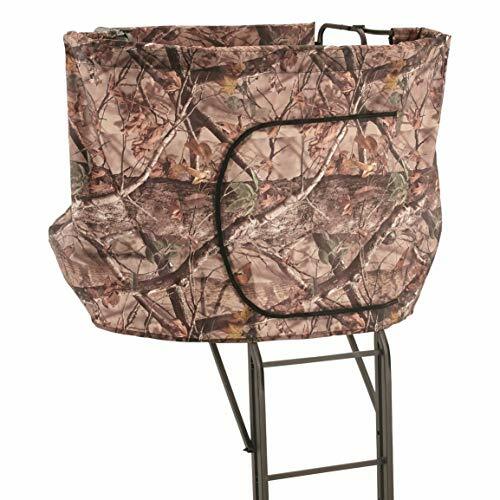 A blind with a camo design is also included to help conceal you during your hunt lookout. This is a pretty good tree stand for you and a friend to take out on a hunting trip. The seats and armrests are cushioned to give you added comfort and support for a full day of sitting and shooting. A blind gives full concealment and harnesses are added as safety features while you’re on the lookout high off the ground. Though there is a good amount of seat room for you and a buddy, this stand could use a bit more leg room so you could stretch out. The powder coat is also not great, so make sure not to leave this stand out during high levels of rain. The pinned ladder sections should make it easier for you to dismantle the stand if needed. This aluminum tripod stand is perfect for taking on solo hunting trips since it is a very simple design that is easy to set up on your own. The lightweight design and foldability allow for easy and fast movement, should you need to leave a location quickly. The seat is very comfortable and adjustable for all your personal needs. The footrest can be used as such, or you can flip it up and use it as a gun rest. The stand measures at around 10 feet, and you get a view of around 8 feet when you’re sitting. The legs and seat lock, so you don’t have to worry about them being unstable or wobbly. Overall, this is a great tripod to invest in if you’re more of a solo hunter. It is lightweight and easy to set up on your own, and the tripod design makes it exceptionally simple to transport around. The legs and seat lock, so you won’t have to worry about anything being unstable, and the footrest can be flipped up and used as a gun rest if you so wish. One thing to note is that it does make a bit of noise when you move it or set it up, so take care to mind your surroundings, lest you scare some nearby prey away. This tree stand is made with a solid and sturdy steel frame, so you can rest assured that it will stand up against harsh wind and weather conditions if needed. An insulated cover, featuring a useful camo design, and an insulated foam lining floor helps keep winter out while you’re safe inside. The insulation also will help in not only keeping the weather conditions at bay but will also lock in heat and protect you from those harsh breezes. Horizontal and vertical windows with a sliding mesh cover are made with the convenience for you to take a look at your surroundings. Overall, this stand is a high-quality product, though it does have a few flaws. The zipper features for the door and windows are not very durable and they tend to snap off rather quickly with frequent use. The velcro ties that are sewn directly into the roof are also not waterproof, so you may experience a few water drips. Other than that, this tree stand is well insulated and can protect you from the harsh elements you may experience on a hunting trip. This stand is designed to hang securely onto a tree, while also providing you with optimal safety and concealment to make for a great hunting experience. It can rest comfortably 15 feet in the air, and you have the ability to sit or stand, as the seat has the ability to flip up, so you can make more standing room if you so choose. 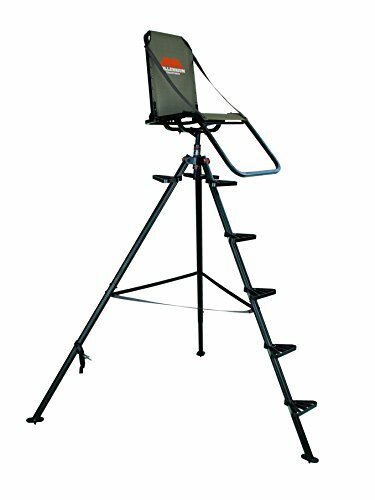 This stand can hold a weight of up to 300 pounds and includes a full body harness for safety precautions. This seat can easily be secured to a tree 12 to 20 inches in diameter. The ladderlock system provides stability as you climb it, as well as the stability blades and bar. Octagonal tubing and a third rail ladder also provide stability as you climb it, so you won’t have to worry about any wobble. This is a great one-person tree stand that will help you get the best views for spotting a target. It is relatively easy to set up and can be fitted around trees that have a diameter of 12 to 20 inches. There are multiple features that help the ladder remain secure and easy to climb, such as the ladderlock system, octagonal tubing, and third rail ladder. The flip-up seat allows you to create more room, should you want to stand to shoot at any time. There are several types of tree stands on the market, and you may be unsure of what type to buy. Below, we’ve listed a few different types with descriptions to help with your decision. This type of stand is relatively difficult to set up, and it must be hauled up and onto a tree, where it is then secured by belts or chains. It is a portable stand, but you may want to also invest in a climbing aid for setup. A ladder tree stand is the easiest to use and can be attached to many different types of trees. The platform features a seat, usually one that can flip up so you have more standing room, and the ladder is easily climbable so you can reach your seat. These stands remain stationary, as they are not easily transportable like a hang-on stand. Tripod stands are great because they are relatively easy to set up and are very portable. They feature three supporting legs that are usually foldable and lightweight. This is a great item to get if you are a solo hunter that moves to different locations. The seats can often turn for a 360-degree view. Once you’re sitting on your stand, there’s no guarantee that deer will even walk by the area as you patiently wait. Here are a few tips and tricks to attracting deer to your stand that you may want to keep in mind for your next hunting trip. People have very distinct odors, and this can alert nearby deer. It is recommended to shower with scent-free soap before each hunting trip and to wear clothes washed with scentless detergent as well. The scent of an estrous doe, produced by female deer during their reproductive cycle, attracts bucks. Early in the season, a hunter should use this scent to take advantage of the territorial nature of male deer. Wind can quickly give away the scent of a hunter to a deer. One tip is to pour deer scent on several parts of the tree where your stand is located, and then make sure your stand is set up high in the tree. Your human scent should then flow above the deer scent, masking it. Deer stands are a fantastic hunting tool because they give you a better view of your surroundings and help you locate your target easier. It takes time and patience to set up most tree stands, and you may want to get some friends to help. Keep in mind the type of trees you have in your area and what stand would best fit the diameter. With an elevated vantage point, you’ll be sure to increase your success.